NOTE: All queries and challenges are being addressed. Puzzle scans (see left) will be available through December and then permanently removed. All available scans are posted. Dr. 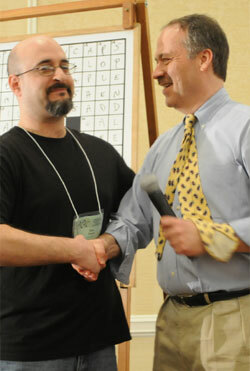 Fill, Matt Ginsberg's crossword-solving program, was the talk of the tournament. It was the subject of a front-page article in the New York Times. On Saturday night Matt gave a demonstration of Dr. Fill's performance on Puzzles #1-#6. Everyone who outscored Dr. Fill on Puzzles #1-#7 won an "I Beat Dr. Fill" button. In the end Dr. Fill was slammed by Puzzles #2 and #5, but still finished impressively in 141st place. Other highlights of the weekend were the 1st World Palindrome Championship (won by Mark Saltveit) and a PuzzleNation team puzzle-solving extravaganza by Eric Berlin and Jeffrey Harris. Liane Hansen, former host of NPR's "Weekend Edition Sunday," and composer/puzzlemaker Greg Pliska provided the playoff commentary. The following 37 contestants solved all 7 puzzles with no mistakes. Erik Agard, Benjamin Aisen, John Beck, Jonathan Berman, Peter Braxton, Catherine Cevoli, Kathie Conarck, Vicki Eastus, Steve Feldberg, Adam Gale, Amy Goldstein, Peter Gordon, Peter Gwinn, Rolf Hamburger, Randy Harris, Francis Heaney, Tyler Hinman, Doug Hoylman, Stephen Kawalek, Louis Lana, Phoebe McBee, Laetitia Morgan, David Plotkin, Arnold Reich, John Reid, Ellen Ripstein, Al Sanders, Andrew Silikovitz, Jeff Stacey, Ken Stern, Andrew Sullivan, Guy Tabachnick, Melissa Tsai, Lawrence Wasser, Thomas Weisswange, John Wilson, Stella Zawistowski.